This is a IDC-50 Male jack on one side and a HDDB50 connector for SCSI II cables on the other. This is designed to take the SCSI-II port out of the system. Used alot on 2940UW cards to allow additional SCSI II device both inside and outside the system. 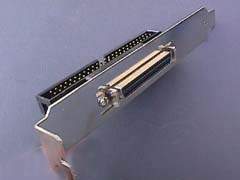 Also popular for SCSI Cards with no external Port.